VegFest 2016 at Jefferson County Fairgrounds has been one of my favorite events for Whole Health Club to date. It gave people an opportunity to learn more about alternatives to health, eating, clothing, and other industries that they may have never been exposed to otherwise. It was such a well-run event that brought some of the best minds in the country in to speak. Speakers ranging from local experts like Dr. Andrew Freeman to nationally recognized speakers such as Dr. Michael Greger. Having the great opportunity to see these experts speak on nutrition, that may be seen as outside the box, was great. There is a shift happening in the world of nutrition and Whole Health Club plans on being on the front line of it. We feel that shifting toward a whole foods plant-based diet is the best way to avoid chronic illnesses. Whole Health Club was the only gym at the event. This was troubling to us at first since there were all these experts that had great information on nutrition, but no other leaders in the fitness industry there. There is nothing that goes more hand-in-hand to a personal trainer than exercise and nutrition. With all the evidence of how much a diet high in whole plant foods can help people achieve their optimal health, why do more gyms not adapt this approach? Well that is a void we are trying to fill. Whole Health Club is the gym with the kitchen, and we are working to align ourselves with the best experts in the nutrition field so that we can bring the best service to our clients. Whole Health Club has decided to make a one stop shop for health. Each of our trainers are able to train their clients in the gym or kitchen, in addition to that we have a chef on staff that makes sure our trainers are prepared to teach. 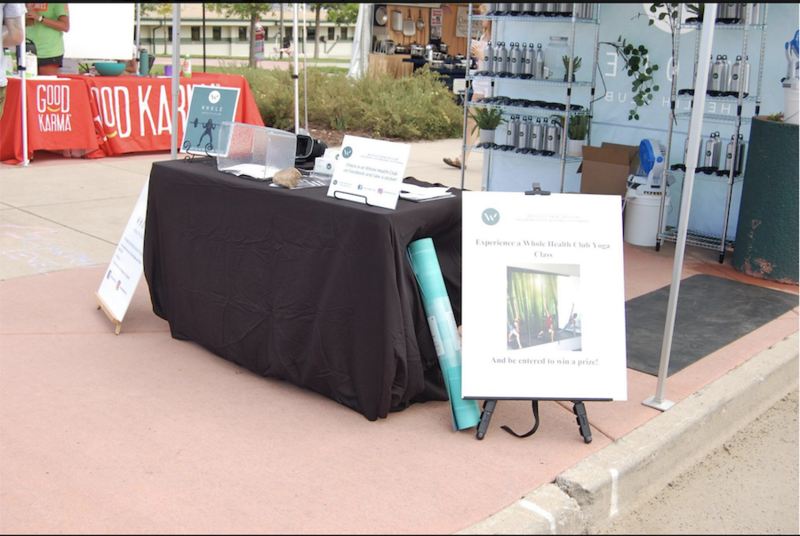 Denver VegFest gave us an opportunity to speak with like minded people in the industry and to truly share the synergistic relationship between food, exercise, and health. VegFest was a great opportunity for us to learn about what people are searching for when it comes to health, and also to see different people’s different walks of life. We had a fun giveaway to raise awareness for veterans by having people do the 22 pushup challenge. It was fun to see people get excited about exercise and the cause. Turning to a plant-based diet can seem challenging at first, so finding resources to help aide your transition is the key. If you are out of the state, we have online training that also provides a grocery shopping list and mock eating plan as well as a workout regimen. Our website is a great resource for plant-based knowledge but also others such as nutritionfacts.org are great for learning about the scientific support of a diet shift. We truly appreciate each person that came by and checked us out, and we cannot wait for next year’s VegFest to see how much this movement has grown.